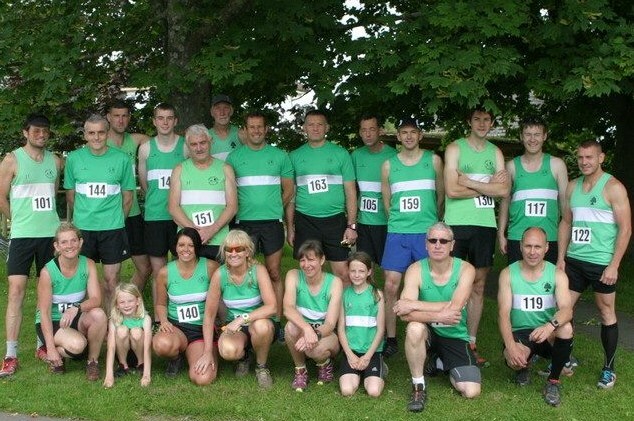 One of Forest of Dean AC’s favorite races was held on a warm, sunny afternoon with 20 runners and 1 canicrosser in attendance. A mere 6 miles with 1500 ft of climbing allowed for all the runners to enjoy a stroll before running along Offa’s Dyke path and plunging downhill to the finish. First to finish was Pete Woodward, 5th in 48.16, with 4 other members finishing in the top 11: Leyton Fleet 51.22; James Dobbing 52.20; Daren Smith 52.53 and John Russell 53.24. First Lady was Stef Francis in 71.35, followed by Jo Babij 84.20. Chris Moore was 1st MV60 in 63.19. Chris Hawkins & Maya were 2nd in the Canicross race in 91.32. Other times: Dan Sandford 54.00; Richard Pegler 54.26; Scott Berry 56.35; Julian Boon 57.33; Marcu Bennetto 59.56; Brian Francis 62.43; Peter Short 65.52; Michael Marks 67.40; Graham Bennetto 70.19; Ian James 81.41; Vanessa Pegler 89.44 and Bev James 90.78. New course records were set for both men & women: James Smith of Black Pear Joggers set a men’s record of 43.12 and Niki Morgan of Chepstow Harriers set the women’s in 53.34.